Combine Sugar and salt in small bone. Pat roast dry with paper towels. Remove skin leaving ¼ inch of fat. Cut slits spaced 1 inch apart in a crosshatch pattern in the surface layer of fat. Being careful not to cut into the meat. Rub roast evenly with sugar mixture. Wrap roast in plastic and refrigerate for at least 6 hours or up to 24 hours. Adjust oven rack to middle position and preheat oven to 250°F. Line a rimmed baking sheet with heavy-duty aluminum foil (see note) and set a wire rack inside it. Place a piece of parchment paper on top of the wire rack. Season pork on all sides with pepper and place on parchment paper. Place roast fat side up and transfer to oven and roast until knife or fork inserted into side shows very little resistance when twisted, about 8 hours total. Remove pork from oven and tent with foil. Let rest at room temperature for at least 30 minutes and up to 2 hours. Increase oven to 500°F and allow to preheat. 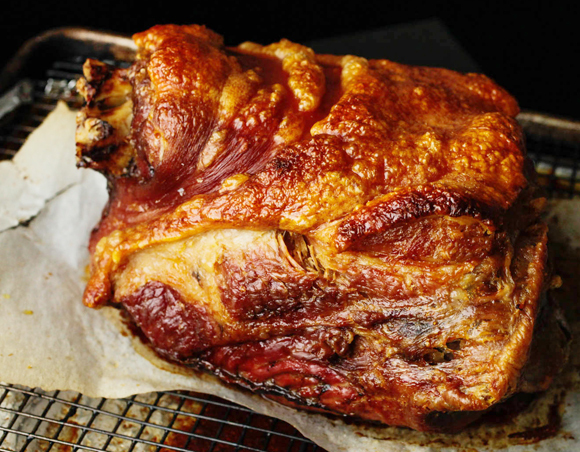 Return pork to the oven and roast until skin is blistered and puffed, rotating every 5 minutes, about 20 minutes’ total. Remove from oven, tent with foil and allow to rest an additional 15 minutes. Serve with port wine cherry sauce or cider golden raisin sauce. Why this roast is so Good. It’s the two-stage cooking process. First, the roast is slow-cooked in a low oven. This method gives ample time for the tough connective tissue inside the shoulder to break down into juicy, rich gelatin while ensuring that it doesn't dry out. At the same time, proteins in the skin begin to break down, softening up its structure. This allows the skin to puff, crackle, and crisp up when you finish the shoulder with a blast in a hot, hot oven.